A very solid Asian-crowd Friday night, but only if you have enough cash for entry and then drinks. If you are a squillionaire, then this is a pretty good place to go. It's a club that oversells its drinks and reserved tables, where status and wealth is promoted with overlying music, rather than the music having the main focus. If you ignore all that then it is a decent place. Only the main room is open tonight, while the second “Boombox” room is for a private event. The main is divided into two areas – The bar at the rear and the main dancefloor down at the front. Enter through the rear to the main bar, which is a complete circle in the middle of the upperhalf of the room. It’s a medium sized bar and could probably hold 60 people around its circumference. 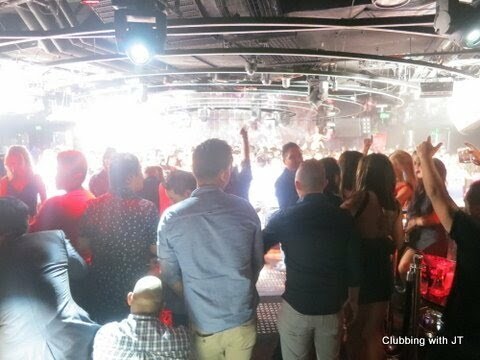 Stagger down to the next half of the room where there is a row of private tables with bottle service. Four tables on each the left and right hand side. It’s smaller than I expected. These tables are the only seats next to and on the same level as the dancefloor. The dancefloor itself is a medium sized floor approximately enough to fit 200 people or so in a packed situation. On the right there is a door to the outside smoking area, where there is a mini bar and some tables. On the left is a small passage that leads to an impressive bathroom. At the front is the DJ booth spanning the width of the floor. Podiums on the left and right with matching dancers. Above are concentric blinking led lights. The biggest thing you probably would notice though is the LED screen behind the DJ, spanning again the width of the room. It blurts out colours and shapes and what nots. $12 per drink is standard. I would advise cheaper pre-drinks on before getting here. Very clean and great for everyone. Best bathroom facilities for the girls. Security is always present to kick out drunkards. Contemporary Rnb, Top 40 some hip hop and then EDM from 1AM onwards. No complaints except for when they decided to throw a “classic” EDM track and make an announcement of it, they only play 15 seconds of it. What’s the point. Almost completely Asian – a mix of local Aussie and International Asians. Early on in the night it was a pretty good ratio around 50/50, then around 12:30 it started to get worse. When the EDM came on, the girls left and what was left was a sh–load of guys. 11:00-11:45: Relatively “dead” (it was still busy but dead compared to Marquee standards) but it significantly picked up and got very packed thereafter until around 1:30. A very solid Friday night, but only if you have enough cash for entry and then drinks. If you are a squillionaire, then this is a pretty good place to go. It’s a club that oversells its drinks and reserved tables, where status and wealth is promoted with overlying music, rather than the music having the main focus. If you ignore all that then it is a decent place.